It's time to stop endlessly searching for Commerce Township carpet installers in your local area. You won't anyone better than our guys right here. The Carpet Guys provide the best carpet installation Commrce Township residents can experience. We can guarantee that you will love the carpet and installation services we provide. Making the decision to install new carpet is not a simple one, but rather an investment. Carpeting provides warmth and comfort that no other flooring material can, and it is aesthetically pleasing. If you're planning on selling your home, carpet can increase the total resale value of your home. Got a busy schedule? Need quick carpet services? We offer next day installation! Whatever your carpet and flooring needs may be, we have the means to handle them. To get the best Commerce Township carpet installation, contact The Carpet Guys. No matter what type of carpeting you choose to get installed, it won't perform well if you don't get it professionally installed. Our installation crews know what it takes to install carpeting correctly, and they are prepared to give you top-notch installation. Upon your request, they will move the furniture for you and also rip out the old carpeting free of charge. The old flooring is placed outside for garbage pickup. Once the room has been emptied, new padding is laid out, and the new carpeting is placed on top and installed. They can then move the furniture back into place, completing the install. Each installation comes with a lifetime installation warranty as well. 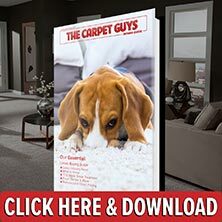 Don't spend any more time looking online for an installer and get the job done right with The Carpet Guys.